England spearhead James Anderson has notched yet another milestone in his glorious career. During the fourth day's play of the second match against India, the veteran seamer became the first bowler in Test history to complete 100 wickets at the iconic Lord's Cricket Ground. In doing so, Anderson has become only the second bowler in Test history to pick up 100 or more wickets at a single venue. Sri Lankan spin wizard Muttiah Muralitharan managed to accomplish the stellar feat at no less than three venues. Muralitharan picked up a whopping 166 Test wickets from 24 matches at the Sinhalese Sports Club Ground in Colombo. He also collected 117 wickets from 16 games at his home venue of Asgiriya Stadium in Kandy. The legendary off-spinner completed the landmark trifecta by garnering 111 wickets from 15 matches at the grand old Galle International Stadium. Across the three aforementioned venues combined, he took 394 of his record career tally of 800 wickets. Anderson joined Muralitharan in the rarest of rare clubs when he dismissed Murali Vijay during the first session of the fourth day's play. Aside from being his 100th wicket at Lord's, the dismissal was also his 550th career scalp. 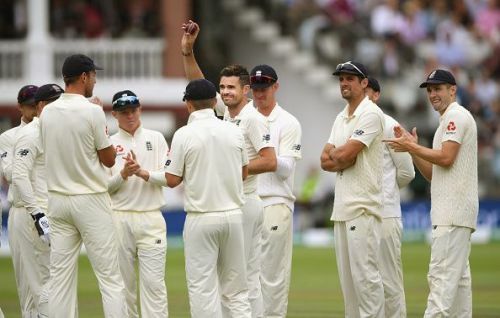 From 23 matches (including the ongoing one) at Lord's, Anderson has picked 101 wickets at an impressive average of 24.22. The 5/20 in the first innings was also his sixth five-wicket haul at the home of cricket. Anderson is *currently fifth in the all-time list of Test wicket-takers. He has 551 scalps from 140 matches at an average of 26.90. The 36-year old is closing in on Glenn McGrath's tally of 563 wickets. Perhaps, it is inevitable that the England veteran will soon leapfrog the champion Australian's tally and become the most prolific fast bowler in the history of Test cricket. After this match, he has three more games left in this series. Considering the shockingly inept manner in which the Indian batsmen have played him, Anderson could even obtain the record in the next Test at his favourite venue in Trent Bridge.